White finish, includes 38 slides and 2 supports. Two way draw, also known as center open. Kirsch drapery rods, Superfine Traverse Rods include drop in brackets, supports and cord tension pulley for installation. Made from heavy guage steel with a baked enamel finish. Exclusive Kirlon on all sliding surfaces. Push in brackets and extension plates are available as an option. Only the finest pulley sets are used. Strong and durable with a slide gate for easy removal of extra slides. Long wearing, stretch resistant polyester cord and continuous lacing for use at either end or to convert to a one way draw. Two way draw, extends from 86 to 150 inches. Wood brackets for Select Wood 1 3/8" diameter wooden curtain rods. 3 3/4" H , 6" return. Note: base price for unfinished, colors are more and will display price in cart. Iron Art by Orion connector for one inch round, hollow curtain rod. Xpress finishes ship within 72 hours. Quicken It finishes ship within 5 business days. Wood wand 49 inches long for wooden curtain rods . Baton for decorative curtain rods for any window. Renaissance Collection by Design Elements. 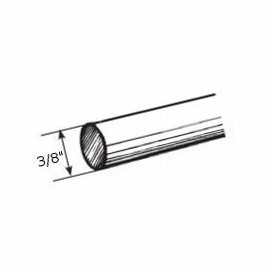 Decorative traverse rods 28-48" projects 3 1/2" to 4 1/2"
Spring tension curtain rods 22"-36"
Drapery spring tension rods are excellent for sidelight curtain installations. Consider the spring tension rod for easy removal from window or closets and leave no installation holes in the walls. Kirsch basic drapery hardware. r702-025: Extra long spring tension rods for curtains 36"-60"
Instructions for hanging curtain rods are included. White finish, includes two end brackets and tow support brackets. Projection, 2 3/4 to 4 1/4 inches. Clearance 2 to 3 1/2 inches. Extra long drapery rods. Light weight fabrics like sheer curtains work well with this rod. Window drapery rods by Graber. Graber super heavy duty features include a universal front loading end bracket, metal adjustable and reversible master carriers ball bearing end pulleys, a spring loaded side gate for adding or removing slides, molded, canted slides, can be converted to one way draw, scored center support base for easy mounting on narrow casings, universal cam lock stirrup, braided polyester cord, and angled tip on overlap arm. Decorative curtain rods smooth ring slides 66"-120"
Studio Coordinates custom decorative traverse rod, includes 34 ring slides. 2 1/2 to 5 1/2 inch clearance, 3 1/2 to 6 1/2 inch returns. 1 3/8 inch diameter, adjustable width from 66 inches to 120 inches. HD27108D: Decorative curtain rods smooth finish with ring slides 100"-180"
Extra drapery rod rings for Studio Coordinates fluted poles, Drapery rods rings and more. Decorative drapery rods for your home. Continental I Kirsch curtain rods 48"-86"
4 1/2" wide face, white finish. Clearance 4 1/2" to 5 1/4" or 7 1/2". A Kirsch curtain rod. 6643-025: Continental I Kirsch curtain rods 28"-48"
White finish fiberglass. For grommeted cubicle curtains or hand draw, pinch pleated draperies. With harness snaps. Fiberglass baton, in 5 lengths.